Last week I paid a visit to Canterbury Park in Shakopee, Minnesota, which is just south of the Twin Cities. Canterbury holds a very special place in my heart as it was the first poker room I ever visited. That was because Minnesota state law only requires patrons to be 18 whereas my home state of Wisconsin dictates you must be 21. It was a law that benefited me as a new player, but now I find another state decree interfering with my fun — Minnesota can’t spread no-limit or pot-limit games. No-limit hold’em is by far the most popular poker game in the world, but at Canterbury it used to be you could only find fixed-limit tables of varying stakes. That all changed a few years back when the property launched No-Limit Hold’em Survival Tournaments, which have been billed as “The closest thing to a No Limit cash game you can find in Minnesota!” The clever ploy has allowed Canterbury and other rooms in the state to skirt the law and essentially offer no-limit cash games. How do these “survival tournaments” work? They are one-table tournaments that last two or three hours, the length of which is determined by the buy-in. For instance, if it’s a $200 buy-in, the tournament would likely last two hours. At the end of the time period, play is concluded and all remaining players will be paid a percentage of the prize pool determined by their chip counts. It’s really quite clever. To keep the players in action, players are allowed unlimited rebuys and half rebuys when they have less than half the original starting stack (the house charges a $10 entry fee for this). So if you start with $200 and drop down to $99, you can rebuy for an additional $200. However, player beware, because if you bust you are out of the tournament! To make it a tournament in the eyes of the law, the blinds are raised at the halfway point. So if it starts at $1-$2, it will be bumped up to $2-$2 for the second hour. Finally, these “Survivals” (as they are called) qualify for comps, jackpots, and promotions, so players get the same benefits as do the fixed-limit cash-game players. It’s not the ideal system — after all, legalization of no-limit cash games would be the optimal setup — but it has sufficed in a pinch. I took the opportunity to play one of the Survival Tournaments when I was at Canterbury, and I must admit I was pleasantly surprised. I didn’t think there would be much difference between it and a normal cash game, but I was wrong. 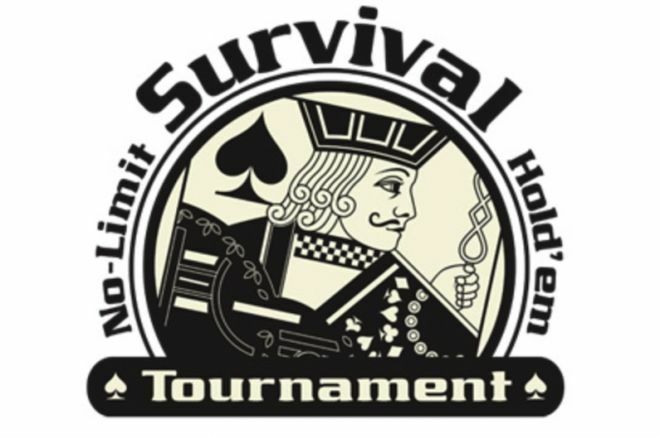 The Survival Tournaments had all the good parts of a juicy cash game, but also injected some tournament characteristics into the mix. The most noticeable was that players played it like a turbo tournament. They were seeing way too many flops, gambling more than they should, and seemed like they were fighting against the clock. If you are curious to read more about these Survival Tournaments, you can on the Canterbury Park website. Graphic above courtesy Canterbury Park.